together furrever: Our Angel Fish! Ava's two favorite things are being outside and playing in the water. She gets so excited when we are outside and someone's sprinklers go off. Ava always runs right over and tries to get as wet as possible. She also will beg you to turn on the hose so she can run through the water. 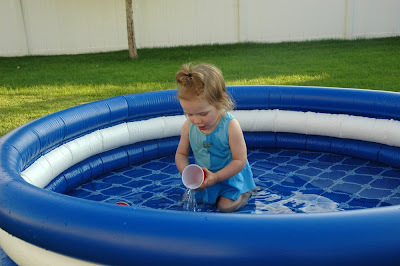 Near the end of July, we finally bought Ava a little swimming pool. 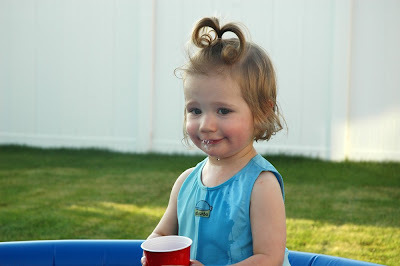 She was so excited as she watched us fill up the pool. 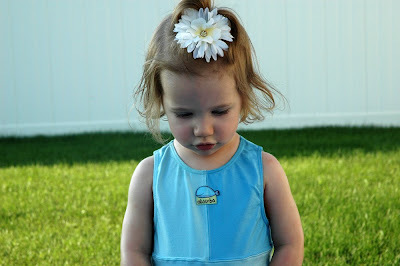 Here she is in her swimsuit wondering when she will be able to get in. 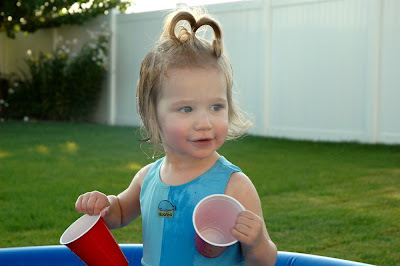 Between the pool and the cups, Ava was having a blast. She was so happy she even smiled for the camera (a rare occasion these days). 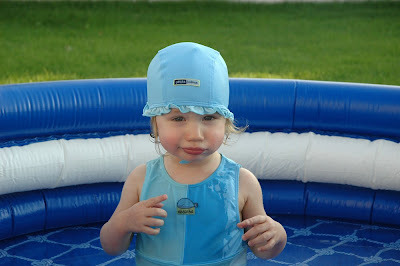 Before getting in the pool, Ava (who usually loves wearing hats) did not want to wear her swim cap. While distracted by the pool, I figured I would give the hat another try. As you can see from her face, she wasn't too crazy about wearing her swim cap (I think the chin strap was driving her crazy). 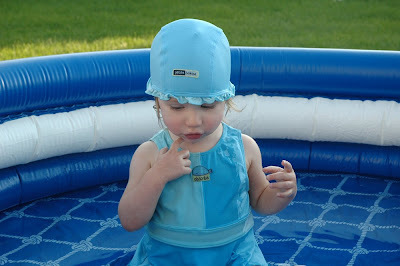 Once Ava figured out how to undo the velcro, it was off with the cap. 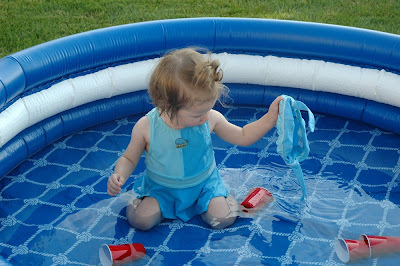 It was a very fun day and Ava loved the pool. We are next going to try out Granny O's pool! She is so cute!! I would have to agree with her expression on the swim cap...too funny!! She's getting so big...as is Klous!! As for lunch I agree we should plan it...and thanks for the other advice!! I'll have to try the pop of choice!! I just hope it gets better soon...it's been rough!! 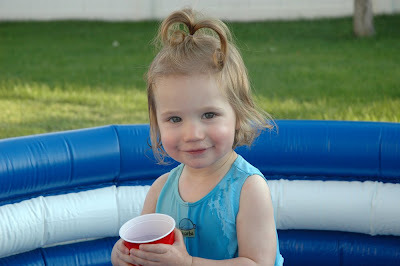 Let's get together soon before it gets too cold and have her and Joshua play in the pool together. We've got one too, though it isn't as cool as yours! Ava looks so cute in her little swimsuit and swim cap. What a fun little pool.